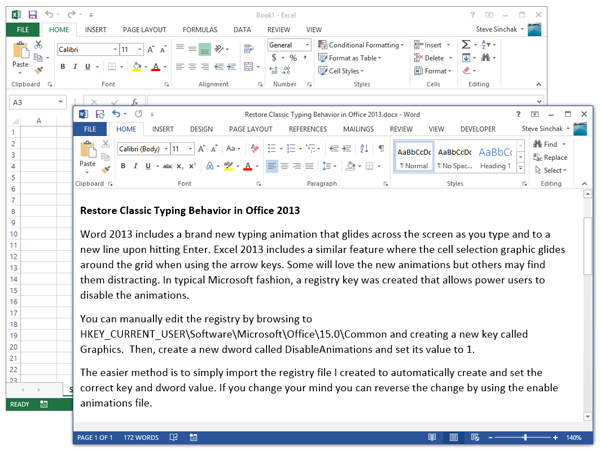 Word 2013 includes a brand new typing animation that glides across the screen as you type and to a new line upon hitting Enter. Excel 2013 includes a similar feature where the cell selection graphic glides around the grid when using the arrow keys. Some will love the new animations but others may find them distracting. In typical Microsoft fashion, a registry key was created that allows power users to disable the animations. You can manually edit the registry by browsing to HKEY_CURRENT_USER\Software\Microsoft\Office\15.0\Common and creating a new key called Graphics. Then, create a new dword called DisableAnimations and set its value to 1. The easier method is to simply import the registry file I created to automatically create and set the correct key and dword value. If you change your mind you can reverse the change by using the enable animations file. You can import the files by simply double clicking on them after downloading. Where did the Classic Games go in Windows 8?